This week, catalysts with coordination. Nina Notman explains. There is an organic reaction that is often compared to a dance in which the couples change partners. It’s called olefin metathesis and it allows the exchange of substituents between two alkenes. With the help of a metal catalyst, the two carbon-carbon double bonds break and reform in such a way that they swap two of their substituents. The reaction is aptly named: a combination of the two words meta meaning change and thesis meaning position. Metathesis is one of organic chemistry’s most important reactions with industrial uses ranging from pharmaceuticals to polymers, and it was work to better understand these reactions that jointly earned Chauvin, Grubbs and Schrock the 2005 Nobel prize in chemistry. Thanks to their work ‘imagination will soon be the only limit to what molecules can be built’, claimed the Royal Swedish Academy of Sciences when announcing the prize. Robert Grubbs’ role was in the development of highly stable ruthenium complexes able to catalyse a wide range of these metathesis reactions. His life’s work drifted down this path thanks to a problem his team encountered when studying the mechanism of living metathesis polymerisation reactions. To their dismay they found that no known catalysts worked for one of the reactions they wanted to look at. In the quest to find a way forward they discovered that ruthenium (II) complexes were highly active polymerisation catalysts. His team continued to work on ruthenium-based catalysts for a number of years. Then in the early 1990s, they discovered that their catalysts could perform the same reactions as the commercially-available molybdenum-based Schrock catalyst without the need for a protective atmosphere. They were much more stable in air and water. Further probing then found that these new catalysts could coax many unreactive substrates to readily undergo olefin metathesis in high yields. Additionally, they avoided another downside to the Shrock catalyst: a tendency to react with other molecular groups attached to the double bonds. The catalysts made by Grubbs were remarkably selective. Tweaking of the catalyst structure went on and in 1995 what is now known as the first generation Grubbs catalyst was born. This was made using a simple one pot method. Today it can be purchased ready to use for around £80 a gram. 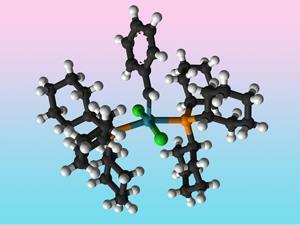 By the end of the century, a second generation of this catalyst had been developed. In this version one of two phosphine ligands has been replaced with an N-heterocyclic carbene. Today, this is the more popular of the two catalysts owning to its additional stability and reactivity as well as a longer life. This extra user-friendliness comes at a price however: it is around £180 for just half a gram. These and other catalysts are made by Materia, a company that was spun off from Grubbs’ lab in the California Institute of Technology better known as Caltech. Despite his huge achievements Grubbs has remained a remarkably humble man. When I met him in the summer of 2009, he explained that this is in part due to his place of work ‘at Caltech in chemistry there are three Nobel laureates right now out of 30 people. I keep telling our young colleagues that it is going to be our new tenure standard,’ he joked. What a truly inspiring place to work that must be. There is no doubt that a substance known as poly 3,4-ethylenedioxythiophene provides an appropriate challenge – but its name is not the most interesting aspect of this rather exotic aromatic organic compound. Brian Clegg reveals all in next week’s Chemistry in its Element. Until then, thank you for listening, I’m Meera Senthilingam. Sadly, on the day we published this podcast, Yves Chauvin, who shared a Nobel prize with Grubbs in 2005, passed away. You can read our obituary here.